My wife and I use headphones quite a bit and sometimes they just get in the way laying around on a desk when you’re trying to do something. So this quick and easy build provides a dedicated place for them to hang in the corner where they are both easily accessible and out of the way. So if you’ve got a few parts and a couple hours, you can put this together real quick. You need two pieces of wood. One is a 2x10x8 block for the base to provide stability. The other is a 2x2x8 block for the top. 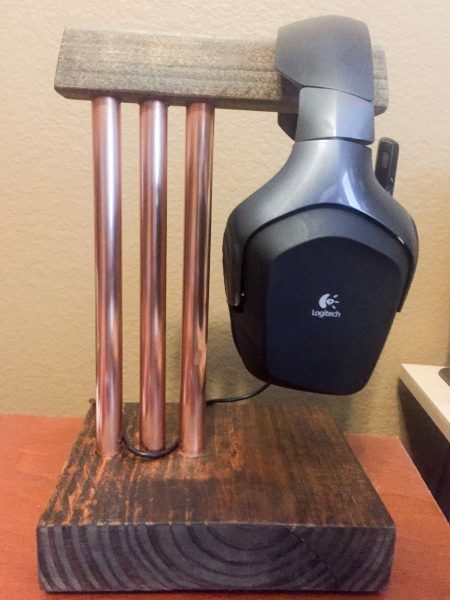 You’ll need three pieces of copper for the supports. I used 1/2″ pipe. I bought a 4′ piece cut it down to 10″ pieces. 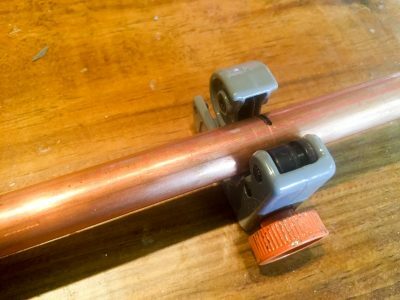 For your tools: You’ll need a copper pipe cutter for making supports. A table saw or miter saw for cutting your wood to size. A 1/2″ forstner drill bit for making slots for the copper pipe. Sandpaper for finishing: 60, 100, 180 grit. A drill press or a hand drill. Your favorite color stain and brushes to apply. Fine steel wool: 000 or 0000 rating. Cut the copper pipes with the pipe cutter. This is a quick build. There are just a couple of steps. Cut each board to the sizes listed in the required parts. Feel free to give the boards a little character with some beveling or angled cuts. Make a mark in the exact center of the bottom board 1″, 2″, and 3″ from the back edge. Use a drill press or a drill with the 1/2″ forstner bit to make a hole in each spot. Drill three holes in each board. 1″, 2″, and 3″ from the end. 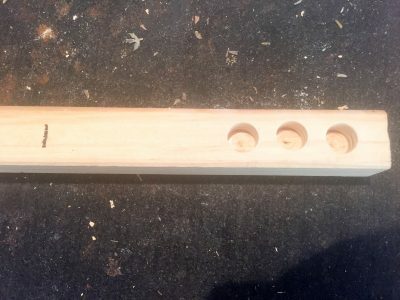 Do the same process with the top board: 1″, 2″, and 3″ from one edge. Sand each board down till everything is smooth. Stain both pieces of wood. Glue the copper pipes into the holes after you stain the wood. While they are drying, make a mark 10″ down from the end of the of the copper pipe and take the pipe cutter and cut the 10″ piece. Do the same with 2 more pieces so you have 3. Polish the copper pipes with the steel wool until they are nice and shiny. 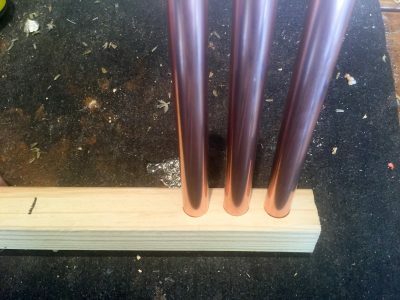 Glue the copper pipes into the slots on both pieces of wood and make sure both boards are straight. When the glue dries, you’ll be done and they will be permanently in that position. 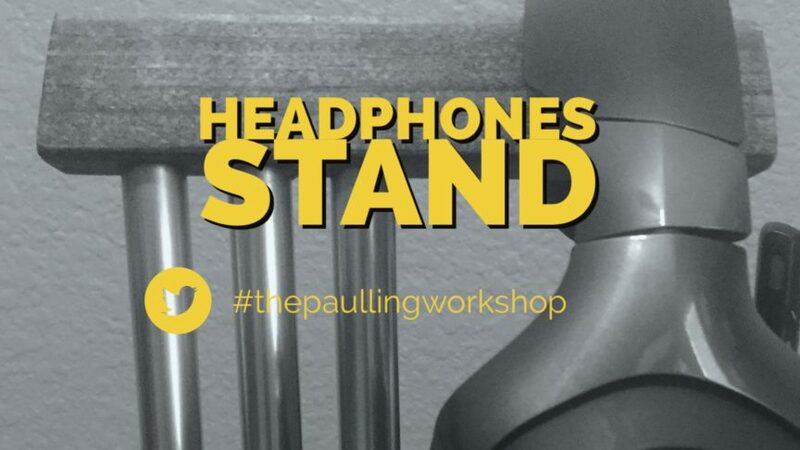 The finished stand. Wrap your charge cord through the pipe to keep it in place.